It’s been almost a week since OnePlus 2’s invite reservation page went online, and it appears the handset has received an overwhelming response. 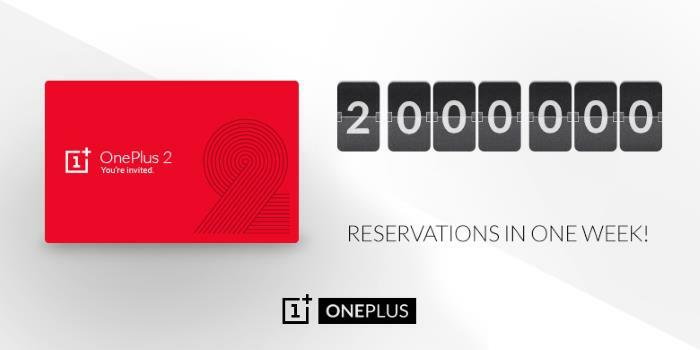 The company revealed on Twitter that OnePlus 2 reservations have surpassed two million in just one week — quite impressive. The company aimed to make the invite system a little easier and hassle free this year with the OnePlus 2. You can just sign up for the reservation list if you haven’t already. This is definitely not the fastest way to score an invite, but at least, you’ll have the invite in some time if you’re on that list. OnePlus 2 comes with an excellent set of specifications, boasting a 5.5-inch display sporting a resolution of 1,920 by 1,080 pixels resolution, a Qualcomm Snapdragon 810 processor and ships with Android 5.1 Lollipop as its operating system. The handset has two versions: one with 3GB of RAM and 16Gb of storage while the other variant features 4GB of RAM and 64GB of internal storage. Other features includes a 13MP camera for photos and videos, a 5MP front-facing camera and a massive 3,300 mAh battery to make sure there’s enough juice for the handset. All of this can be yours for just $329 for the 16GB storage/3GB RAM version.